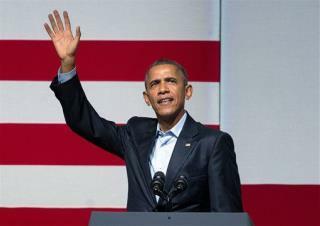 (Newser) – President Obama had a few tips for Kanye West—who in August claimed he would be running for president in 2020—while opening for the rapper during a fundraiser Saturday in San Francisco, the New York Times reports. "In case Kanye’s serious about this whole POTUS thing—or as he calls it, Peezy—I do have advice for him,” the New York Daily News quotes Obama saying during the fundraiser for the Democratic National Committee. This is news worthy, really? Obama isn't black, he's half white and half black, what used to be called Mulatto. To call him black based on his appearance is racist.